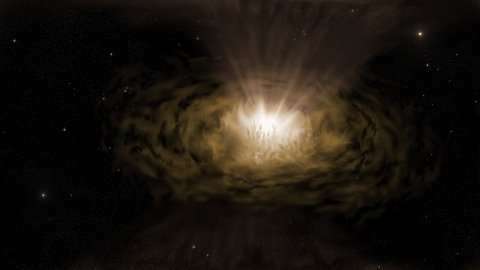 Researchers at the University of California, Santa Cruz (UCSC), believe clouds of dust, rather than twin black holes, can explain the features found in active galactic nuclei (AGNs). The team publish their results today (14 June) in a paper in Monthly Notices of the Royal Astronomical Society. Many large galaxies have an AGN, a small bright central region powered by matter spiralling into a supermassive black hole. When these black holes are vigorously swallowing matter, they are surrounded by hot, rapidly-moving gas known as the “broad-line region” (so-called because the spectral lines from this region are broadened by the rapid motion of the gas).